Create a charming path and wetland theme in your garden using these Esschert Design Turtle Stepping Stones. 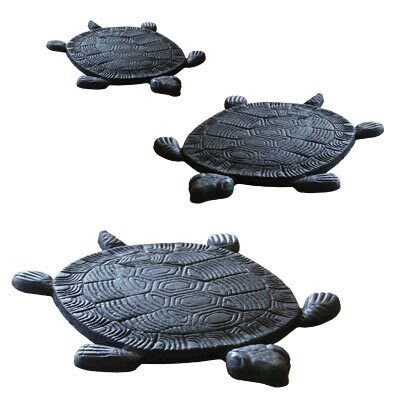 This set of 3, cast iron stones is perfect for directing foot traffic through your landscaping, while the recognizable turtle figures add a fun hint. A slightly raised head and tail on each stone begin the familiar turtle shape, while texture throughout the oval stepping area evokes a shell. Four feet extend from each shell shape, furthering the look, and the cast iron construction offers durability. The 8.5" length and 7.25" width of each center section allows you to perfectly nestle the stones within your landscaping. The patterned shell captures attention, while the black finish on each piece meshes with many settings. Celebrate different wildlife in your landscaping using these Turtle Stepping Stones. Note: This case pack includes 3 of the Esschert Design Turtle Stepping Stones.